This craft all began with the fact that my friend is getting married and the theme for her wedding is blue birds. It certainly is a lovely wedding theme as blue birds mate for life. I found part of her gift right away, by walking into the tea room/gift shop in Morrisburg, called “The Basket Case”. 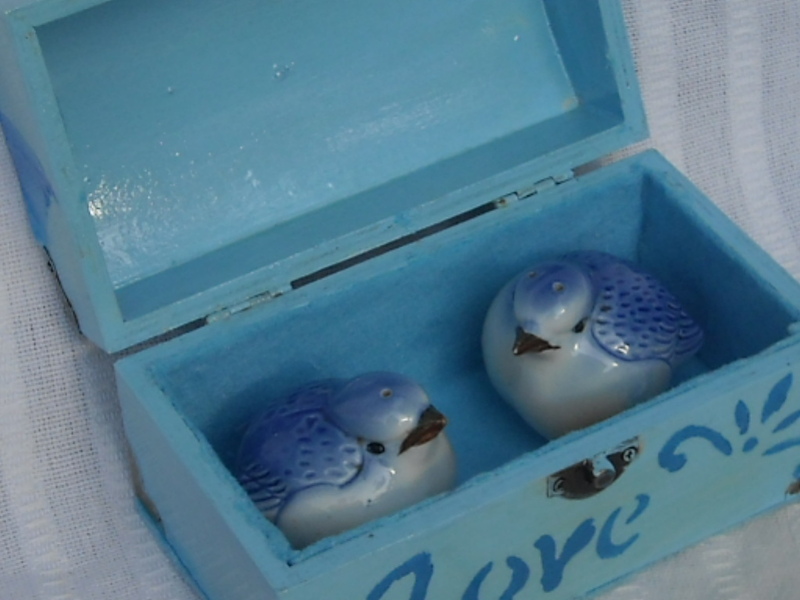 It was there that I discovered the first part of her gift -a perky little pair of blue bird salt and pepper shakers. I was thrilled with my purchase, but I wanted the gift to be extra special so I decided to make a decorated container for the pair. I found an unpainted wooden chest-shaped box at the dollar store and planned how to transform it. I decided to paint the box a pretty sky blue with acrylic paints. Once it was painted inside and out, my husband sprayed it with acrylic glaze. Then I lined the inside bottom with soft blue felt which I glued in place and trimmed with scissors. I wasn’t sure what I would use to decoupage the top until I remembered that I had some pretty blue flowered paper napkins. I first of all separated the two layers of napkins and then I cut carefully around the flowers. I then covered the top of the box with white glue (I will probably use less glue in future projects). I placed the cut out flowers on the glue in a pleasing pattern. After the glue dried I placed a number of blue and silver sequins on the box top as well with glue (I restrained myself from adding more than about ten). My next step was to add Mod Podge by brush all over the paper flowers and sequins. I did about three coats, drying each coat carefully before adding the next. 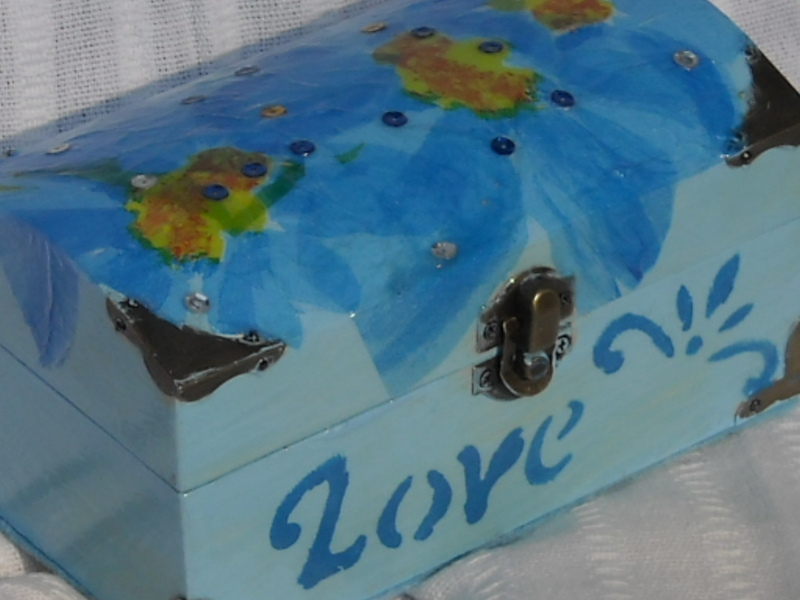 I stenciled “love” in a darker blue on the front and covered it with Mod Podge too. The final step was spraying acrylic glaze over it all again and putting the blue felt on the bottom of the box to protect any table it is put on. Altogether, I was very pleased with the results, although I need more practice in stencils. I had also been working on a painting of blue birds to go with the gift. I tried it in various medium and liked the results I got with water colour pencils, gouache and soft pastels the best. I was very anxious to know how my friend felt about the gift, so I was relieved that she and her husband-to-be seemed so delighted with it. It was an enjoyable project to do and I would do something like it again. I’m thinking of maybe making my three grandchildren treasure boxes with their names on them the same way. I love having crafting projects. Looks great Mom! I’m glad Shirley liked it too!! Thank you. I will have fun planning something they each will like. What a lovely gift, and a great idea to make boxes for your grandchildren as well.